We are delighted to announce that Nessa was awarded cultural hero of Dublin. Cultural heroes are recognised for making a difference in their community and going above and beyond. A beautiful picture sent to us from the Ambo school in Ethiopia. Money raised from the babysitting nights goes directly to sponsoring a teacher in the Ambo School. LATE NIGHT SHOPPING/ CHRISTMAS CELEBRATION BABYSITTING NIGHT! 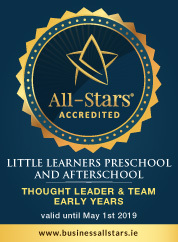 Due to expansion Little Learners Montessori School wishes to recruit an Early Years Educator for our preschool service with the option of working in our afterschool service. Have you signed up for our 1pm Preschool Club!? We have lots of exciting activities!! We are now taking bookings for our summer camp which will commence on the 3rd July. The camp is open to all children in the community. We are excited to announce that we are opening a new preschool and afterschool facility on the grounds of Westfield House, Ballymun in September 2017. We will be running a fun filled Easter camp from Monday 10th until 21st April (excluding Good Friday and Easter Monday). Our very own David Doyle who is an afterschool leader in ABCD released his debut single, 'Lions'. Have a listen! We think its brilliant. Montessori will finish up on Thursday 22nd December. All children are welcome to stay until 1pm for our Christmas Party. RTE Television recently dropped in to see us and film an episode on Sing Along With Clara. We cannot believe the school year is coming to an end, where has the time gone. This year's graduations will take place in the theatre in ABCD. A massive thank you to all our parents who organised the hugely successful quiz night, came along, bought raffle tickets and donated prizes. The parents of the children attending Little Learners Pre-School and the Stay and Play After-School club have arranged a Pub Quiz to thank the Nessa and her amazing team.